A monochromatic aesthetic is a bold way to make a statement in any room. Though we're programmed to think about matching similar colors and keeping a diverse palettes in our space, monochromatic color schemes actually look intentional and eye-catching. And the good news is that a monochrome style doesn't have to feel overly match-y. Find a color you love and use it as a base for the room - whether you want to take it all the way or keep things subtle. This stunning navy room seen on matthewsmitharchitecture's Instagram is everything we love about monochromatic spaces and the perfect inspiration for your own home. The deep blues are pulled throughout the room, but pops of yellow and green break up the space and keep it fresh. Timid about using a bold color scheme in your monochromatic room? An all-white room is a popular, minimalistic way to try out a single color palette in your space. This wonderfully chic bedroom from My Scandinavian Home maintains the whitewashed feel throughout the space, adding in pops of black and different shades of white. We can't imagine a better place to spend a lazy Sunday morning. This gorgeous, light-filled space from My Scandinavian Home proves monochrome can still be subtle. By sprinkling dark blue color accents throughout the room, the space feels tied together, and the decor purposeful. When aiming for a low-key monochromatic look, try to keep your accessories as close in color as possible to give things a uniform feel. If committing to a single color palette in your living space is too daunting, start small. This black and white bathroom from designstuff_group is the perfect first foray into monochromatic design. A simple color scheme like this one feels calming and spa-like, especially when sticking to black and white. Try this look with any color, and you'll find your bathroom is your favorite place in the house. This pink nook from Olivia Keyes on Pinterest is feminine in all the right ways. The velvet bench lends texture to the space and keeps it from feeling flat. We love how the different hues of pink carry over from the wall tapestry to the plush carpet. The decor feels varied—but more importantly, calming and inviting. Who knew an all-pink room could feel so spa-like? We love this black and white vanity from snyggsnag because it feels exceptionally fresh and clean. By keeping the accessories and art prints a single hue, the space feels instantly modernized. When you remove color, you begin to pay more attention to the clean lines of the shelves and desk, and notice how every object in the space carries a sense of purpose. We are green with envy over this monochromatic room from Trendland. If you've ever wanted to live in a deep, dense forest, here's your chance. Even though the colors are dark, the room feels playful and lighthearted. We love how the real-life greenery seamlessly ties into the deep green couch and walls. This beige and gray bedroom from Coco Lapin Design is everything we want in life. Between the neutral linens, the gray built-ins, and the varied textures, this monochrome room is simply stunning. Though the space is cozy, the uniform color scheme helps it feel tidy and cohesive. A monochrome nursery can be a great, gender-neutral way to lend a modern sensibility to the space. This adorable little room from whitefoxstyling is one we wish we had grown up in. The designer keeps the black-and-white scheme throughout, from the throw blanket to the pom pom banner. We love black dining rooms, and this artsy look from Kerry Lockwood In Detail is no different. 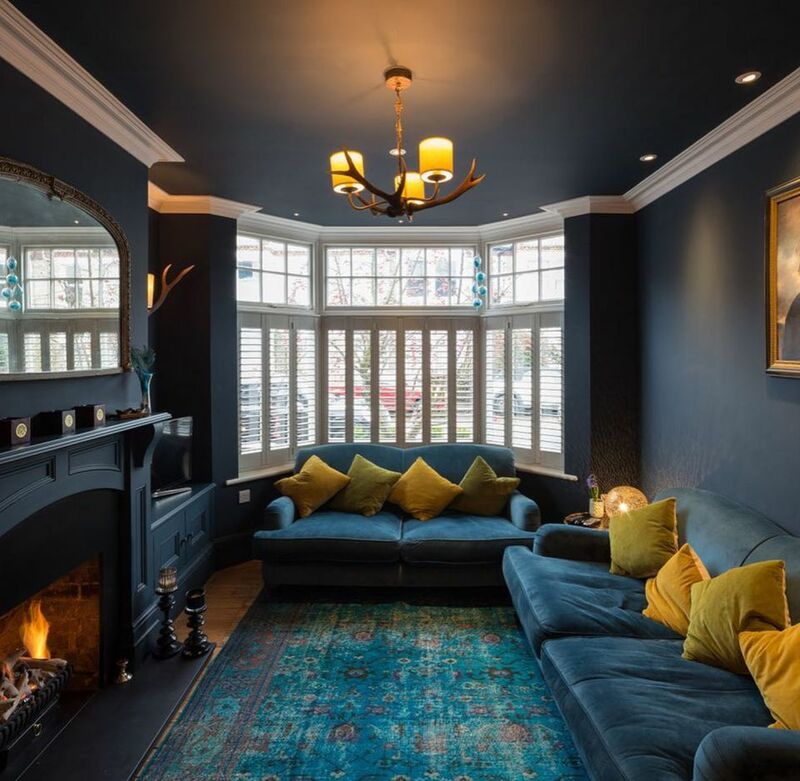 The black paint ties in perfectly with the faux-fur rug and the seating. If using a very dark shade (like black) scares you, throwing in a few matching pieces can be a great way to get the "entry-level" monochrome look. This teal look is not for the timid. Designer Twig Hutchinson paired nearly-perfect teal chairs with a deep teal wall to create an optical illusion that helps the room feel even larger. The chairs almost blend in with the space and gives it a luxurious feel. If monochromatic decor schemes don't scare you off, maybe you're ready for a truly "loud" color palette. This bold and beautiful bedroom from The Designer Pad pairs orange walls with accessories like a hanging pendant lamp and a blanket to really make a statement. This look isn't for the faint of heart, but the payoff is so worth it. By now you know that all-white rooms are very in, and there's just something about the minimalist look that we can't get enough of. This vaulted bedroom from themerrythought has layers of different shades of white with a touch of blue and natural wood. When adding accessory colors to your monochrome room, look for classic combinations that play well with the primary color palette. If purple is your favorite color, you'll probably go gaga over this bedroom from ellas_muse_homedecor. Every piece matches so perfectly, but the approach doesn't feel overpowering. By mixing up the shades and tones of this bright and bold color, the room feels varied and purposeful. You probably haven't considered a black color scheme in your kitchen, but this look from My Unfinished Home may just change your mind. We love the monochromatic color scheme mixed with uber-modern finishes that feels chic and high class. This airy room from Vosges Paris is the perfect blend of a monochromatic design scheme and a bit of French flair. We love the slate blue walls that carry through from room to room, and the light pastel chair that makes the look cohere. Plus, the monochromatic style helps the two spaces feel more like one unified room, giving it an open concept feel.